This week we were down to our last pots of frozen starter and needed to culture some more ourselves. We had done a trial run about 4 weeks ago which seemed to have worked so on Monday & Tuesday we made up another couple of batches. Monday’s was made using St James whey and Tuesdays’s was made using milk. As yet I’m not really sure what the difference will be between the 2 of them or indeed if there will be any. One theory says that the starter will work more powerfully in a less fat rich medium than milk as the fats can inhibit starters whereas in whey, there is available lactose for them to consume but hardly any fat.Some cheesemakers culture up starter every 2 or 3 days and don’t freeze it, but for the quantities that Martin needs to use it in, this is simpler and if it’s frozen at the right time you don’t harm the bacteria. They need to be put in to freeze in the lag phase before they start reproducing because once they start to reproduce they’re vulnerable. So on Monday we made the starter up in whey (largely to be honest because I’d already set both vats of milk by the time Martin came down to the dairy). And on Tuesday I took out a litre of milk from one of the vats before I added the starter or rennet and we made up starter in milk. The process was basically the same though – we poured 1 litre of whey into a sterilised stainless steel container which was then put into a pan of water and put on the hob. The water in the pan boils but the whey doesn’t reach the same temperature and is basically pasteurised. It then needs to cool down of course because the bacteria in the starter work best at around 30C and will be killed off at the sort of temperatures involved in pasteurisation. Interestingly when heating whey, of course, you make ricotta, so the curds need to be strained out after it has cooled and before the starter can be added. This doesn’t happen when making milk starter but you do have to dispose of the skin that forms on the top of it as it cools. Each day we take a pot containing about 100ml of starter and in general we tend to use only about 65ml at the most so there is some spare. Once the whey had cooled down, therefore, we added 10ml of this starter to the whey and stirred it around to distribute. If making in larger quantities, the rule would be 1% starter. Then the whey and starter was poured into pots which were chilled in the cold store for about 20 minutes before going into the freezer. To use, we take them out of the freezer the day before at ideally about 12 or 12.30 and it takes about half an hour to thaw out and then the bacteria get to work. By the following morning when we’re ready to use them, they will have acidified. 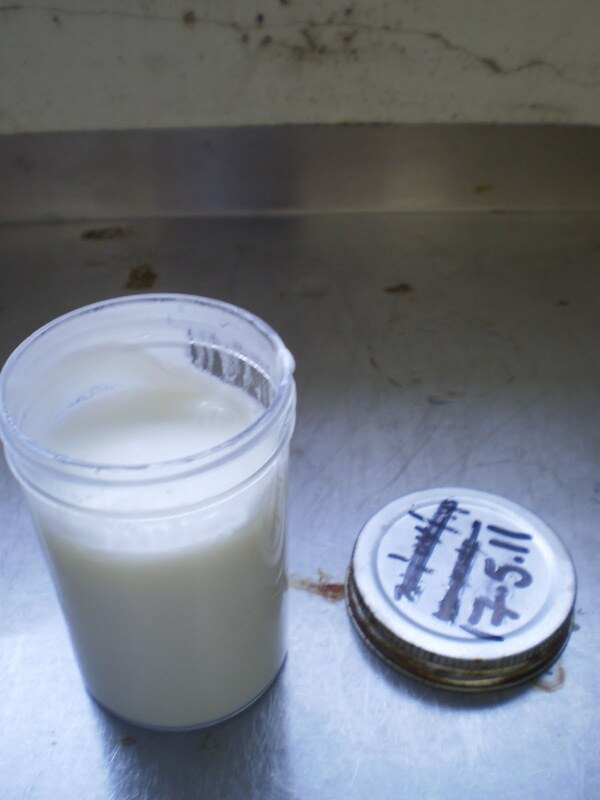 If using the milk starter, as it acidifies it will also thicken to look less like a pot of milk and more like yoghurt. 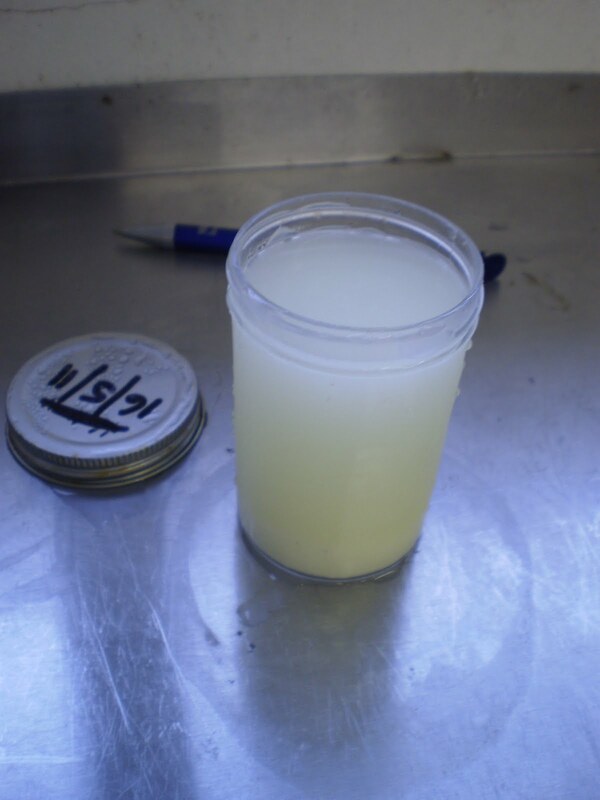 The whey starter however doesn’t so we have to do a titratable acidity test on it to check it. So far I’ve only used the new starters twice though so it’s hard to draw any meaningful conclusions on which is more active and effective from 2 TA readings but it will be interesting to see if the theory that the fats in milk inhibit the starter does actually work out in reality. Looks like fun! Can't wait to taste the cheese with you when we're there on Tuesday. See you soon. Congratulations !!! !Very interesting.You've got a fan from now on ! !